Last week, I had the honor of keynoting the Mobile Marketing Strategies Summit in San Francisco, to provide a strategic perspective of how mobile –and social technologies work together for today’s top brands. Sadly, we found that most companies are developing mobile tactics. That’s right, tactics. Why? As the latest technology came around, companies would prescribe towards them in a haphazard way, or rely on their agencies to select the app to appease a ‘mobile solution, quickly’. Instead, companies should evaluate how their customers use mobile technologies across their entire life and brand process. Working closely with the research team here at Altimeter, we were able to structure a mobile strategy based on the customer life process –not just on features and functions, and found quite a few examples of companies spanning the gap. If you’re seeking a strategic perspective, please watch the video below –and see slides. Caveat: My primary focus is social so you’ll see some crossover between my perspective and how mobile connects. Also, we’re hiring a mobile analyst (and other roles) that will be primarily focused and go deeper than I will have time to, while I’ll continue to focus on customer strategy across many platforms. 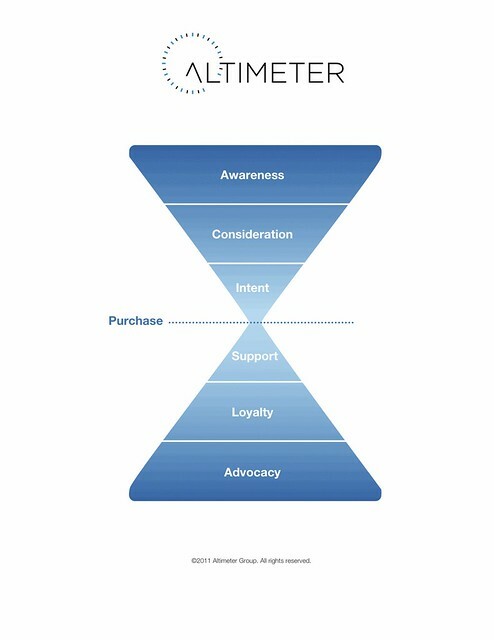 Above: Customer Hourglass Framework. Build your mobile strategy based on the entire customer experience –not just on the technologies on hand.